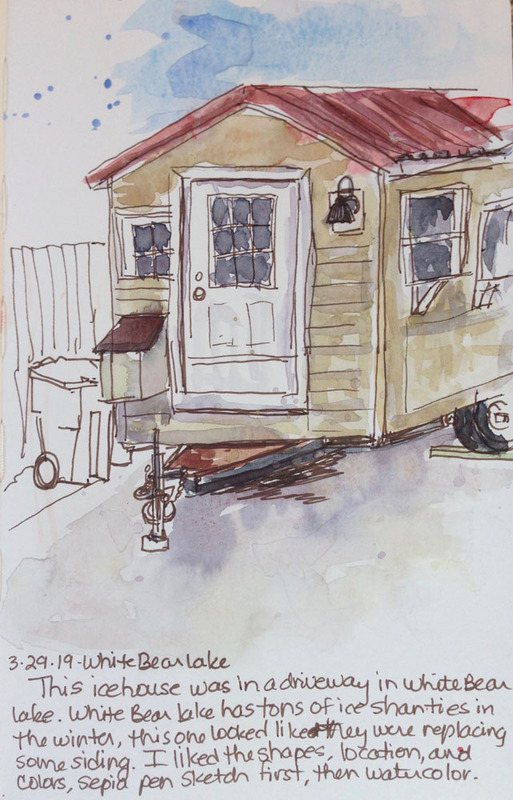 Yesterday I went to White Bear Lake and drove around looking for sketch subjects. I came across an ice shanty parked in someone’s driveway. As it is still feeling like winter, I decided to sit in my car and sketch it. I used a sepia pen for the sketch, then colored in with watercolors. I am always amazed how people like to park these structures on ice and sit in them for hours to catch a few fish in the bitter cold. Not something I’d try, but to each their own! You know it’s spring in Minnesota when you see ice houses off the ice and stored somewhere. A few years ago I had the opportunity to paint at the Art Shanty project, a festival at White Bear Lake that features ice shanties and art organizations and activities. The weekend at the end of February was so warm that all the shanties and activities had to be taken off the ice and happened along the shore line. I lucked out to paint outdoors for those few hours in nothing but a sweatshirt and jeans! This framed pastel (below) is the result of my efforts. I painted a shanty and a guy sitting in a lawn chair and it was great fun!